Participants are responsible for their own lodging. Please do not make your hotel reservation until you have registered for the conference. To secure ASCD group rates, make your hotel reservations by the listed cutoff date. If the cutoff date has passed, or if the room block is full, the hotel will offer the ASCD group rate based on availability. Resort Fee: A $15 Daily Resort Charge will be added to the room rate and includes: Complimentary Guest internet access; Disney shuttle bus transportation; 2-16 oz. Starbucks beverages; 2-16 oz bottles of water; DVDNow rentals; 10% off in gift shop with $30 buy; $5 off one Disney attraction ticket sold at concierge desk. Hotel reservations can be made online or by phoning the Hilton Reservations hotline at 1-800-782-4414 and referencing the group code "ASCD" for the group rate. Group rate is available through Thursday, May 23, 2019 or until the room block is sold out. 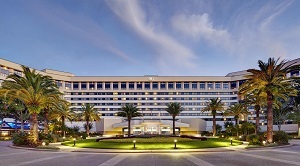 All conference sessions will be held at the Hilton Orlando Lake Buena Vista. An additional block of rooms is being held at the Hilton Orlando Buena Vista Palace with room rates starting at $189 for ASCD Conference on Teaching Excellence attendees. A limited number of rooms will be available through Wednesday, May 22, 2019, or until sold out. Reservations can be made online. Remember to register for the conference and make your hotel reservations early. The conference and hotel room blocks will fill quickly. Register for the conference prior to making your hotel reservation. Secure your hotel reservation by the cutoff date. Hotel rate is not guaranteed after the cutoff date or if the ASCD room block is full. Make your hotel reservation online or by phone. Confirm your hotel reservation by contacting the hotel directly. WorldTEK Travel Management invites you to use our ASCD Travel Booking Service, offering attendees access to airline and car discounts. Please call 1-844-663-5055 to speak to an agent. Please note this will incur a small agent-assisted fee. Note: Authorized paid travelers and staff should not book using this service. Additional information on booking your conference travel will be sent to you in your travel letter. Note: Activities and events listed here are not officially part of the ASCD Conference on Teaching Excellence program, and any associated costs are the responsibility of the attendee. There is plenty to see and do in the beautiful Orlando area. Orlando is home to year-round sports, restaurants, historic landmarks, lively art districts, and a world-famous magical attraction. With warm sunshine, swaying palm trees, and breathtaking skies, there's no better way to balance learning and play. ASCD conference attendees and their guests may purchase specially priced tickets to Disney theme parks that are valid for seven days before and after the conference event. Extend your conference satisfaction with the leisure of exploring the fabulous Walt Disney World® attractions. For full details, go to mydisneygroup.com/ascd2019.